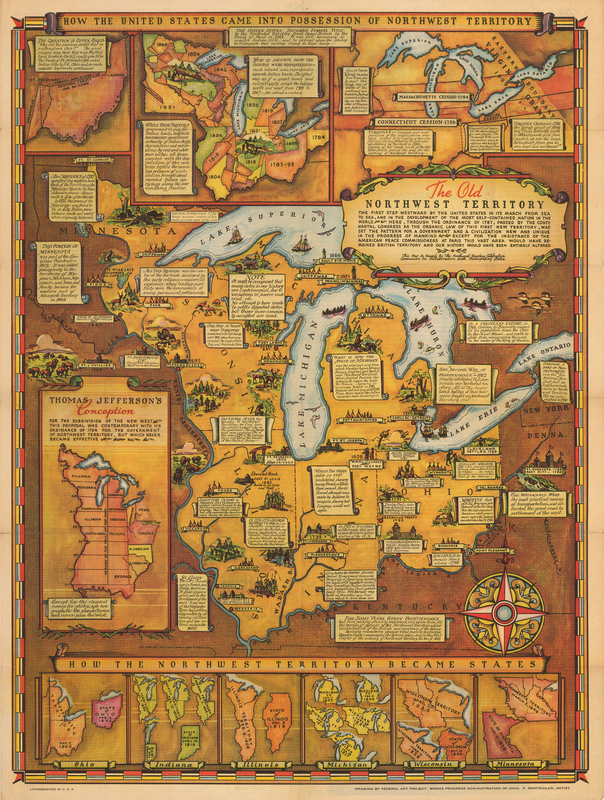 Fascinating, beautiful and brightly colored, this vintage pictorial map by Fred Rentschler is a 20th century lithograph in which is incorporated much style from earlier eras of mapmaking, a factor which tends to draw one into the map rather quickly. The closer one looks, the more there is to be discovered. The map covers the Great Lakes area, including Ohio, Indiana, Illinois, Michigan, Wisconsin and Minnesota. It was ordered by the Works Progress Administration of Ohio and is full of information and historical facts, with drawings of forts, settlements, and animals (both wild and domesticated). Wildlife is depicted in lovely fashion, rendering the salient populations of the area in lively and colorful form. Housing is depicted with forts and wigwams in ample supply. Agricultural endeavours are represented by scenes of plowing, sowing, reaping and harvesting in various places. People, including Europeans, Americans and indigenous American Indians are rendered in many places in a wide variety of employment and situations, and at various points in time through the centuries. Below the inscription is a small map of the Territory along with a note describing how prophetic Jefferson’s vision had been, despite his never having seen the Territory in person. Another inscription of note is enclosed in a title cartouche “The Old Northwest Territory” and further describes how important the acquisition of the territory was to the development of the United States. A lovely compass rose based on centuries-old cartographic tradition further embellishes the map in the lower right quadrant. The map constitutes a textbook in pictorial form. Condition: This folding pictorial map is in A- condition, with a few fold separations.